More bass from smaller cabinet? Those of you who have been visiting TNT-Audio for the last six years or longer may remember one of my first reviews of a product hailed as 'The World's Best Loudspeaker'. I was slated by the manufacturer for a too negative review (he ordered TNT to remove it), and received criticism on a hi-fi forum for being too complimentary. 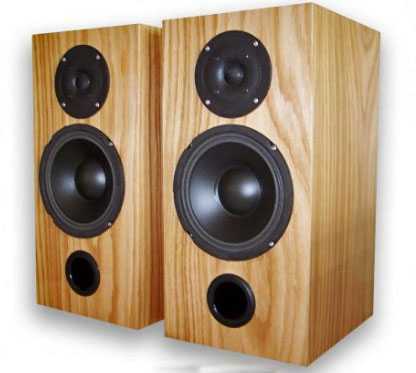 So you may be surprised that I took on a review of another pair of loudspeakers that also make some quite tall claims! "It has a full power envelope that runs from 20kHz down past 15 Hertz. This is most of the full power envelope, although the lower -3dB point cannot be determined as it is probably infra-sonic." An amazing statistic for a speaker measuring just 205 x 415 x 250 mm, and using a 6 inch bass driver! According to Alacrity, this was all possible due to a patented bass-loading system although (perhaps understandably) they didn't want to go into detail about it. The designer went on: "I have invented a loudspeaker cabinet loading technology that enables production of a standing wave, not only at the natural resonant frequency (actually, it doesn't have one), but at every frequency at which it is driven in a range spanning single-figure cycles to over 10 kilo Hertz. Side-effects of my bass loading system include the fact that it severely retards the excursion of the bass unit linearly at all operating frequencies (allowing it to be fed with more power) without harming output efficiency. This keeps it within the linear excursion range of the bass unit, even at high dBs (100+). It also corrects the phase-shift distortion produced by the cross-over electronics, allowing the output signal phase to be matched perfectly to the tweeter at crossover frequencies." The advantage of being a reviewer is that we can get hold of a product to test the claims, and that's exactly what I did. The review sample arrived in a rather smart flight case that offered the speakers more than adequate protection. 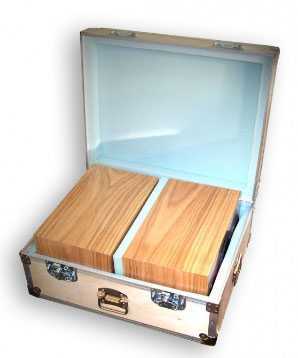 Given that the flight case (if the buyer wants one) will cost another 200 UKP, I'm not sure who it will appeal to. I can't see impoverished university students buying a pair of the Caterthuns and taking them to parties all over campus. But it's an option so there's no harm done in offering them. Out of the case, the speakers appeared very nicely finished in their English oak cabinets. 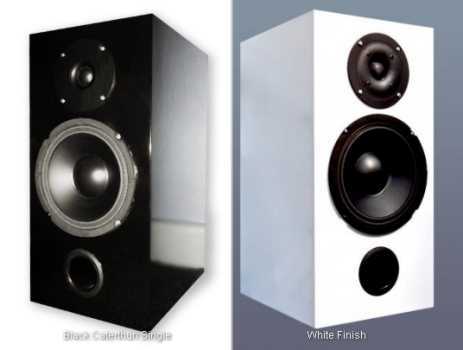 The Alacrity web site states that they are also available in a white finish, and there is also a picture of a pair finished in Piano black although (at the time of writing) Alacrity were still seeking a manufacturer who could produce a good-enough finish. The speakers are quite heavy for their size, weighing in at around 10 kilos each, and come with four terminals for bi-wiring or bi-amping. The Caterhthuns are designated as bookshelf speakers but you will need a very sturdy shelf, and I feel that they are better suited as stand-mounters. I set the Caterthuns up in my auditioning room. I didn't have a suitable shelf so placed them on speaker-stands. About 45 cm from the side walls, and 60 cm from the wall behind them. This was too far forward from the rear wall and the bass sounded lacking in body, although it did produces an exceptionally deep sound stage! Moving the speakers back to a few centimeters from the rear wall brought the bass into balance, and that's where I kept them for the course of the review. Alacrity recommended using a valve amp with the Caterthuns so I brought out the Miniwatt N3 and the Yarland M34. I partnered those with either one of my own valve buffers, of the excellent KingRex pre amp. I also tried a pair of the Temple Audio Bantam Gold amps with the valve buffer. Just about any combination of these worked well with the Caterthuns, and even the Trends Audio bi-amp system sound good too. It appears that the Caterthuns have been tuned to work optimally with a certain system presentation. It's more usual with a commercial loudspeaker to tune it so that it is slightly compromised as regards optimum performance, but will work with a wider range of equipment. So the Caterthuns won't drop into any old system and sound good, in fact they may sound bad in some systems. Of course, a good dealer should be able to demonstrate then with the 'right' system, and advise customers if they need to change their system. Anyway, in short, the Caterthuns really showed the differences (nuances?) of the preceding equipment. My personal favourite was the KingRex Pre amp driving the Miniwatt N3 although that system didn't quite go as loud as I would have liked. The Caterthuns are said to be easy to drive but at 86 db efficient they will obviously take more to make them go loud than a more efficient speaker. The Caterthuns produce quite a deep sound stage, even when they are pushed back against the wall. As regards width of sound stage, I've heard wider. They didn't seem to go much beyond the location of the speakers although this wasn't an issue as the speakers were set quite wide apart anyway. Within the sound stage the imaging is pretty much pin-point as I found when listening to Patricia Barber singing 'My Girl'. She and the bass guitar were kept well apart and positioned almost holographically. I always like to play a few tracks from the Roger Walter's album, 'Amused To Death' to see how the Q-sound effects are portrayed. The Caterthuns passed that test well, indicating that there are no phase problems. I had particularly wanted to check out that issue as the designer had told me that the modifications made to extend the bass do affect the phase. However, there are seemingly no adverse effects from those modifications. With such claims made about the bass performance of the Caterthuns, that was one of the first areas that I wanted to listen to carefully. Placed close to the rear wall, they do indeed seem to put out a lot more bass, and deeper bass, that I would expect from a smallish speaker with a 6 inch bass driver. And more, the quality of the bass is very good, tight, well defined, fast, and tuneful. Putting on 'Graceland' by Paul Simon, the title track had my foot tapping almost uncontrollably, a sure sign that the timing is spot on. Turning to 'The Might of Rome' from the Gladiator sound track, I was also very impressed how these small speakers captured the awe of that track. Scale wasn't on a par with my own speakers, but they use 15 inch bass drivers, and 12 inch mids. I guess we come up against the law of physics, and just how much air a 6 inch driver can move. That said, for a speaker of the size of the Caterthuns to play such a piece of music and make it such a moving experience, is no mean feat! The Caterhthuns also portrayed the emotion in that track as well as anything that I have heard. The dynamic range of the Caterthuns is very good. Putting on the album 'Sister Drum' by Dadawa I was very impressed how audible were the quietest sounds while playing at a lower volume that allowed me to experience the loudest sounds without disturbing the neighbours. This was so with everything that I played, with the quieter details being distinctly clear. The Caterthuns are slightly forward in their presentation, and dig out the last ounce of detail from whatever they are playing. I personally like that style of presentation. There is no harsh treble, and I found no trouble in listening to them for hours on end. Whatever I played on them sounded good and I wouldn't say that they favoured one genre of music over another. You do get 'everything' with the Caterthuns. Listening to Nick Drake, the tape hiss from the original recording was clearly audible. On the album 'War of the Worlds' by Jeff Wayne, the opening track features a spoken commentary by the late Richard Burton. How accurately a system portrays Burton's well-known voice is a useful benchmark, and again the Caterthuns did a good job. If the system is doing its job, you should also clearly here the echo on this track with Richard Burton sounding as though he is speaking inside an echo chamber, as was quite clear in this audition. There's excellent 'presence' too. On the Pink Floyd album 'Wish You Were Here' the feeling of actually being in the elevator was most real. A Bach Toccata and Fugue also displayed the bass capabilities of these small speakers. There wasn't quite the sense of awe that I get with my open baffles and their 15 inch bass drivers but unless you are comparing the two, the performance of the Caterthuns was more than acceptable given their size. A quick delve into the Dreadzone album 'Live at Sunrise' also demonstrated that these speakers don't leave the listener wondering where the bottom is, and can really 'rock'. Turning to a few familiar classical tracks, what I noticed with the Caterthuns is that instruments at the back of a large orchestra, percussion, harp etc, were much better defined, with a real sense of presence. They really do dig out every little detail in the recording. Again, they were good at portraying the emotion in that type of music. It's difficult to find anything negative to say about the Caterthuns. That they are a bit forward in their presentation is an observation rather than a criticism. Some (like me) will like that, others may prefer something a little more laid back. But over the weeks that I listened to them, I found them most enjoyable to listen to, fun even. I'm not sure what trick has been used to get that extra bass from the small boxes but it does seem to work, and work well. If I am to criticise something, it would be the claims made by the manufacturer. I have no means of accurately measuring bass below 20 Hz so I can't challenge the claim of "sub-sonic to 20,000 Hz +/-3dB". But I would suggest this is likely to put off potential customers rather than attract them. I can (tentatively) go along with the first part of this statement: "the Caterthuns (Brown or White) deliver an extra 2 or 3 bass octaves compared to any loudspeaker in the same size class, and at least a full octave more than ANY other loudspeaker system on the planet." but not the second as my own speakers subjectively sound as they go lower and louder. It's a bit like claiming that a Fiat 500 can out-perform a Ferrari. As I found, the Caterthuns do indeed go (much) lower than speakers of a similar size, and do that very well. I think if that's the (only) claim made for them, it will attract much more serious attention that some of the comments on the manufacturers web site. I guess what I am saying is that these speakers are worthy of serious consideration particularly if you need a small speaker and don't want to compromise on bass performance. So forget the hype and if you can, just try and hear them. Summing up, I give a big thumbs up to the little Caterthuns. I can't help wondering what would be the effect of applying the same technology to a slightly larger speaker with say an 8 or 10 inch driver! All hi-fi is compromised is one way or another but the Caterthuns seem to go against the rule that says that bass must diminish as the speaker size gets smaller. They do almost everything well, and more importantly they sound good too. Enjoyable and fun are the two words that best sum up their performance. I'm not sure that they are really 'bookshelf' speakers but they will not take up much room positioned up against the wall on some decent stands. I now know that if I was restricted to having a small listening room (and couldn't use my open baffles), I may only be looking at a choice of one speaker to keep me happy! Do remember though that these are not speakers that you can put into any old system. They demand equipment that will work with them, so if you fall in love with them at a dealers, you may find yourself changing one or more of your other components to get them working optimally in your own system. Despite that, I give them a strong recomendation!